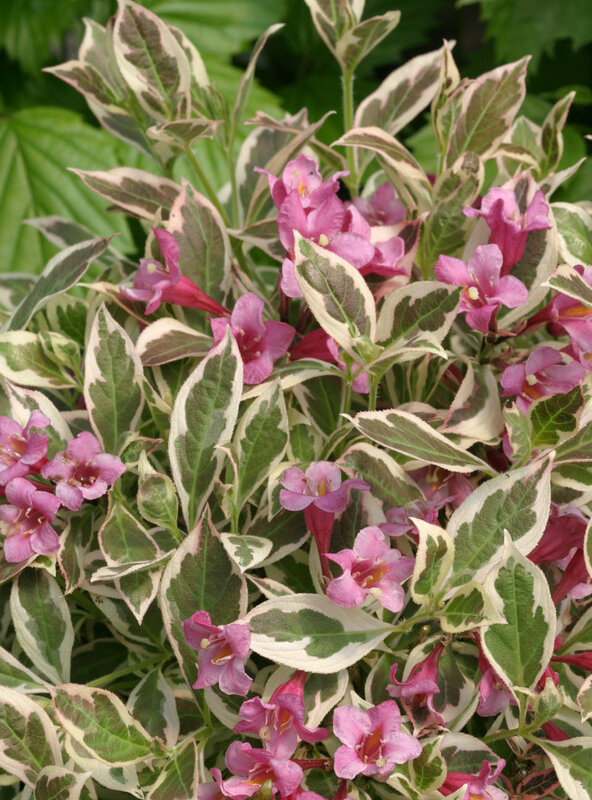 Pink spring flowers and green and white variegated foliage all season long. Dwarf plant needs no pruning. Season long color. Dwarf. Deer resistant. Prefers well drained soil but is adaptable to many soil types. It is best to prune right after flowering ceases, but pruning is rarely needed. Slow growth rate. Will continue to flower sporadically on the current season's growth. Medium moisture. 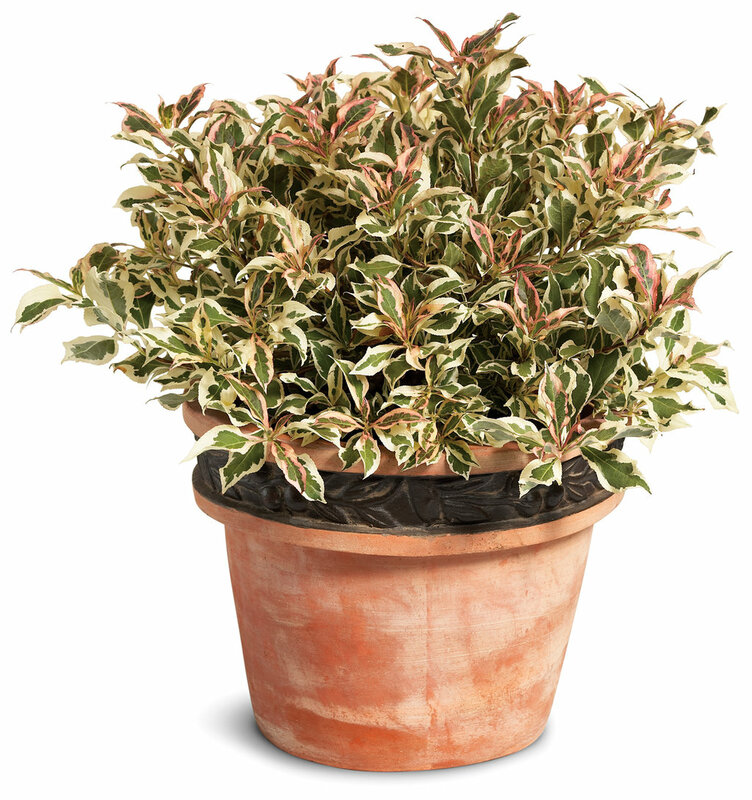 Browning leaves in early fall are a result of the plant going into dormancy earlier than most weigela. This is a benefit letting the plant shut down earlier and prepare for winter. 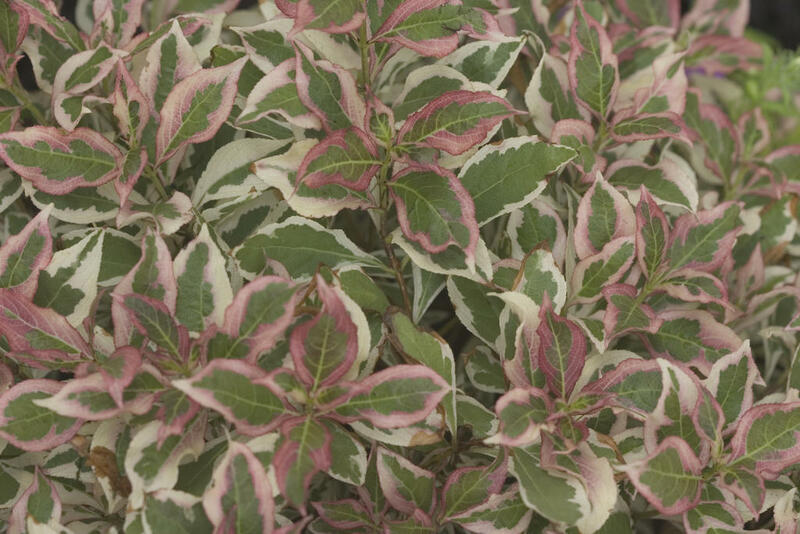 In southern states, plant in a partial shade location. 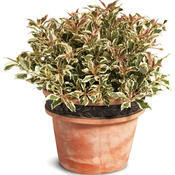 This dwarf masterpiece is a sport of Weigela florida 'Tango'. 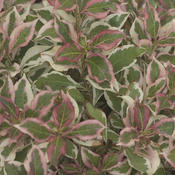 It is the first dwarf variegated Weigela to be introduced. 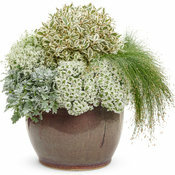 Its tight habit and colorful foliage make it very versatile. 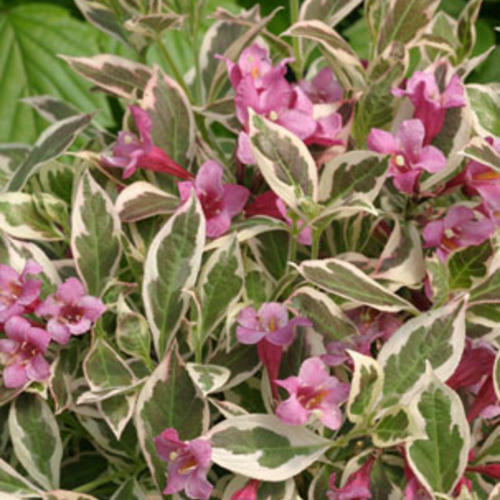 Variegation changes depending on light exposure - whiter variegation in shade and pink variegation in full sun. Possible applications include an artistic drift along the edge of an annual or perennial bed or as an accent piece in a container. 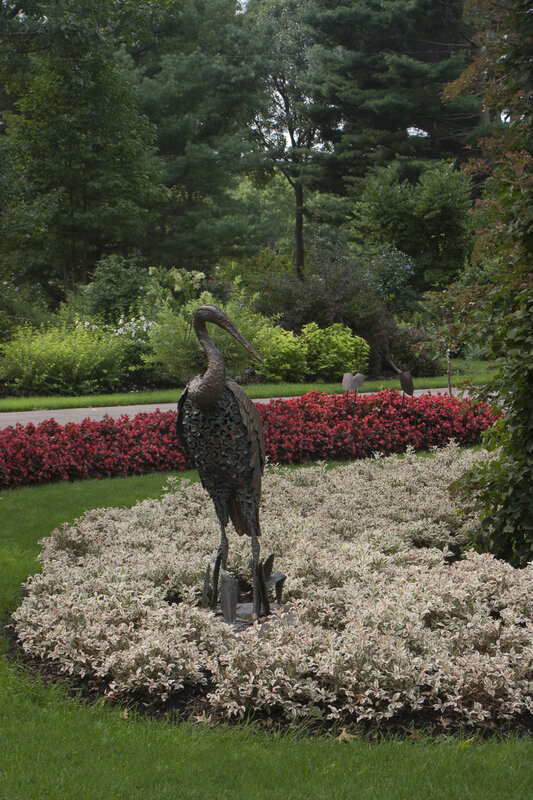 My Monet creates poetic beauty in any landscape and adds a splash of color to semi shady areas. Everyone who has seen this beauty falls in love at first sight. 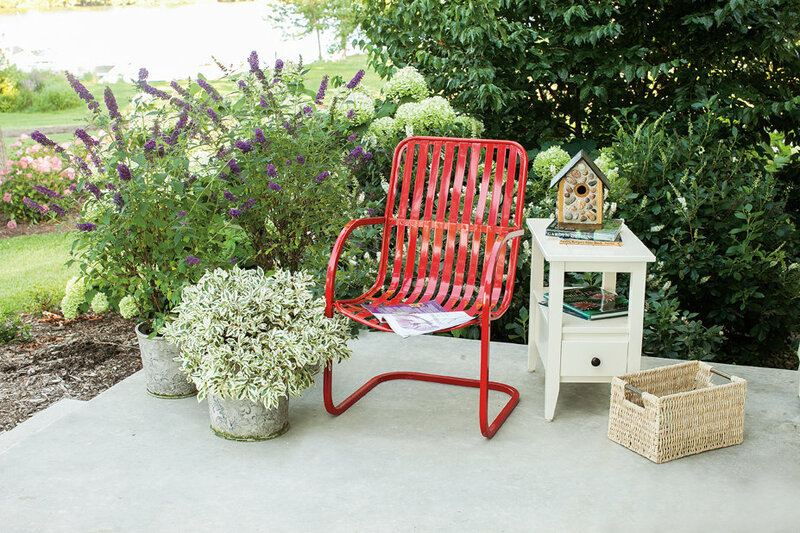 Use it like you would use Coleus, to add season long color, but don't worry about replanting next spring. This little shrub comes back year after year. My Monet has won numerous awards, including a Gold Medal from the Boskoop Royal Horticulture Society and a Gold Medal from Plantarium. Absolutely love My Monet!! So much so, I've about bought all of the local nursery's supply, mixing them into my perennial beds. 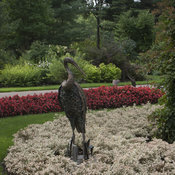 Proven Winners are my plants and shrubs of choice. Marilee, OH. I have replaced two of the three that I have planted in my front garden as they did not survive. South-facing garden. Last year was the first year that I felt they were thriving and growing. However, I will be replacing all three this year with something else as new buds are only appearing on a few branches of all three.. I am very disappointed as it is a very pretty specimen. As there is some growth, I plan to replant them in my back garden. This plant has been in my garden for several years and has become my favorite shrub. The blossoms are pretty but the foliage is the star. I love it. I planted three of these six years ago. They have not performed well. Little change in size over six years. Am at the point of considering removing them. Would NOT recommend. I planted a drift of My Monet about fourt years ago in an area that gets very little direct sun and has heavy clay. It took about two years before it started to spread and look really good. 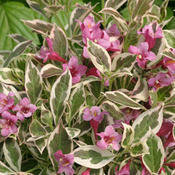 However the colour variegation is good and it has spread very well. Spread is about 24-30 "
Mine is so beautiful. I get lots of compliments. Hardly had any flowers. Haven't grown, they are the same size as when I bought them 4 years ago. Only 2 of the 6 I bought survived. I moved a few of them to new locations in my garden thinking that might help there growth, it didn't help. THEY WERE PRETTY WHEN PURCHASED, THIS IS THE 3RD YEAR FOR THEM. LAST YEAR THEY HARDLY BLOOMED, SO FAR THIS SPRING ONE OF THEM IS GROWING GREEN LEAVES. NOT REAL THRILLED SO FAR. I am crazy about this plant. I went out and bought 2 more last year. Beautiful shrub doing very well in full sun!